Rockford, Ill. – In honor of the outstanding medical community in Rockford, the IceHogs are welcoming all medical professionals, friends and family to the BMO Harris Bank Center on March 25. 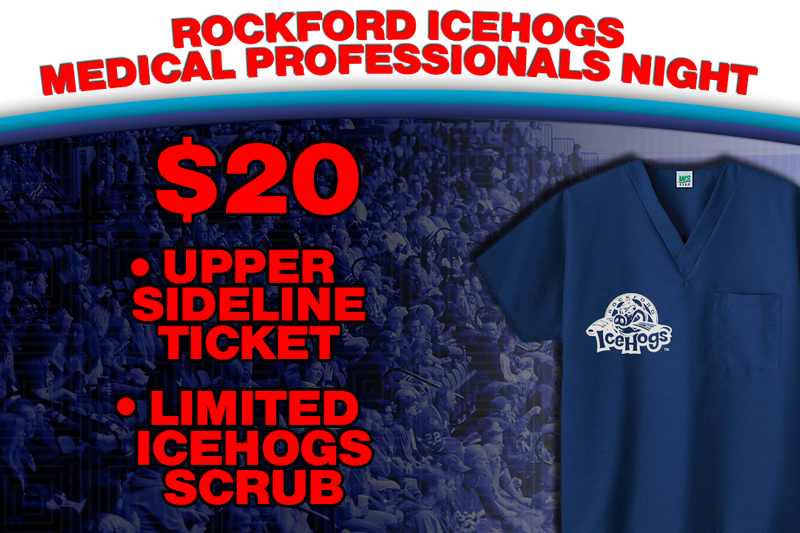 For just $20, medical professionals can receive an upper sideline ticket along with a limited-edition IceHogs scrub top. The scrub top is blue and features an IceHogs logo on the right side of the chest. Following the game, all those who purchased the special package are invited down to the ice surface to take a group photo while wearing their new gear. A limited quantity of scrubs are available and can be purchased on a first come, first served basis. Doors will open at 6 p.m. and the puck drops at 7 p.m. on March 25 as the Grand Rapids Griffins return to the BMO to face the IceHogs in a Central Division showdown. Tickets can be purchased by calling Juliana Ferrandino at 815-847-6389. There is no minimum requirement to order. Additional tickets (without scrub tops) can be purchased for $15 each.